Leading Manufacturer of v wire screen pipe, v wire water well screen, widget wire screen, rainy v wire screen, trapezoidal wedge wire screen and v wire screen for buildings from Thane. 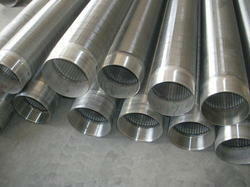 SS 304 Screen for BorewellPerforated Screen. The v wire screen is the stainless steel material, grade SS-304, cage type trapezoidal wire wound screen. A screen is evenly distributed continuous slot opening of 0.75MM so that it has a more open area for minimum turbulence and loss of energy.The diameter of the V wire screen is 150 mm, length 0.5 meter.